A November Friday, the sun has set but automobiles bloat the lot. It’s a pay day after all, and I pause to look at the sky before entering the store to sift the rubbish for book s. Business at the Japanese restaurant down the road is brisk; the used car lots had a good week. The ABC store is full, too. I walk now, passing the used baby strollers by the front door. A group of older men stand around smoking cigarettes and staring at the horizon. The sun has set on the business week but few appear wealthier or more content than these silent men. A man is talking with the socks in a bin inside the store. He curses them for not being paired. The clutter seems less organized today. Broken golf clubs are paired with the canoe paddles or old skis. Compact discs and DVD’s are unevenly distributed on the shelves and the old dolls, jumbled behind the glass case, watch the men outside from fallen formal poses. A pandemonium of books, too. No hand has brought mercy to their disarray or swept the dust from their piles. Reinhold Niebuhr’s The Irony of American History leans against Victoria Holt’s The Pride of the Peacock. What children would they make, were there only time. The sun has set and employees are scarce. The week’s sweat permeates all things. Occasionally an office door will close. Quick steps. A car outside. Writing about the closing of the magazine Hyperion, Franz Kafka notes in the opening lines that “Only the Hyperion Almanacs of 1910 and 1911, which the public now scrambles for like the diverting relics of some disagreeable corpse, still remind us of it directly.” Kafka’s simile betrays that he was aware of the literary collecting of modern publications in Prague, in his time. The sentence quickly returns to its work, which is to commemorate the magazine itself, yet the simile resonates through it all: nostalgic readers and collectors pursue the old copies as would fanatics stripping the body of a saint. That’s always been a favorite of mine among the first sentences of the world. Looking around the nearly empty thrift store, doused with disinfectant perfume and work week twilight, I think it may as well be the opening line of the store’s biography. It is the sort of place, or unsorted sort of place, that is unique. By this I do not refer to the technical definition of “unique” in book collecting. A “unique” copy is defined by collectors and dealers as a copy with a specific added trait. For instance, a copy of East of Eden inscribed by John Steinbeck to his editor Pascal Covici would be unique; because of Steinbeck’s inscription, there is no other copy like it in the world. It is radical in its singularity. No, in retail mercantilism as in book collecting, the notion of singularity must be adjusted according to the type. For instance, the thrift store is not any retail store. It belongs to a type of store, which by legal definition are second hand re-sellers that are most often owned by charitable non-profit organizations. As such, it is of a type. Michael K. is also of a type: the thoughtful, introspective son of an overworked mother, he has a characteristic congenital deformity, but he is not unique. There is Camus before Coetzee and Kafka before Camus and Dostoevsky before Kafka. Were he unique he would be entirely alienated and what Coetzee writes of him (and South Africa, by extension) would be impossible. And so we accept the contradiction, that Michael K is of a type, albeit of a rare kind, because in admitting his deformity as typical we come to Michael K as accomplices, a bit like the naïve doctor who narrates the novel’s second part, perhaps, but not for long. And so like Kafka with his Hyperion, we recognize a book’s rarity and value as materialized in aesthetic form, as making an epistemological claim to the reader. Beyond it, we may recognize a cultural value, a social function it performs for the audience, the class, or the city. Yet if we seek these qualities while losing sight of the exchange value it has in commodity form we become seduced by horizons beyond the book which is, counter-intuitively, as tangible and tactile in its materiality as all the preceding characteristics I have noted. From it, jobs are made for other artists and teachers, and on it, jobs depend, in the form of book manufacturing, or even the employees of this book purgatory where I hold the book. Thus a book exists always at the edge of a singularity to which it cannot be reduced; even the “unique” copy should be renamed a mutation so as to avoid that mystification – it is merely a modified variation on the type. And so I hold The Life &Times of Michael K, and review the copy in my hands. I look up to see a man trying on a used coat. It is too large for him, that is clear, but he seems to like its grizzled fit. This was Coetzee’s third book. The true first edition was published in 1983 by Ravan Press in Johannesburg, South Africa, but most dealers note that edition was itself printed and bound in the U.K. The reason for why they note this fact is unclear, but it would seem to assert, beyond mere fact, the Anglophone presence in South Africa, as if to say “Coetzee is ours, too, you know.” There is never mention of whether or not the first U.K. edition was struck from the same plates as used for the first South African edition. The first U.K. edition of this novel was published by Secker and Warburg is the second most highly collectible copy on the book market. This likely has something to do with the novel’s reception history, as it won the Booker Prize in 1983.The difference in average prize between the first South African and first U.K. editions is notable. An autographed, collectible copy of the South African edition sells for between $900 and $1,000 U.S. Dollars, and the first U.K. edition for roughly half that price. 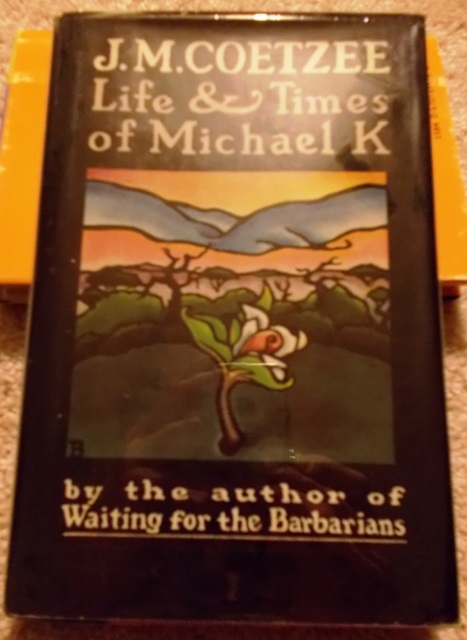 The first U.S. edition is the third most collectible type of copy of The Life & Times of Michael K (it should be noted that a German edition also appears on some listings). The 1st U.S. edition is the one I hold in my hands, at the end of the aisle, near the shelf of large print books. In terms of pricing, collectors can expect to pay between $300 and $400 U.S. Dollars for a fine, autographed copy. Unsigned, it will cost between $200-$250, with some lesser signed copies on that range. The copy in my hands, will “nice” to the average reader, would probably sell for one third of that price, due to several minor flaws and the availability of other, better copies of the U.S. 1st edition in relatively common supply. As such, it is of little collectible value, albeit a nice copy for the $1.00 I will pay for it as I return to the lot. Value is relative, of course, to the initial investment, assuming the merchandise will find a future buyer. But before I place the book on my shelf at home to appreciate for some other collector’s profit when I am dead, I read the book and note that its flaws are as shocking and compelling as those of its protagonist. In descending order, the correct words should be “head,” “the,” “to” and “he.” Why muse on these errors? I have no interest in criticizing the publisher or editor. Maybe the typesetter went on a bender, or worked all day with only one contact lens. Someone had a bad day is all; the fact of their grouping so close together suggests as much. Indeed, with the number of errors one encounters in today’s newspapers and on-line, in a time when copy-editing and proofreading has become “expendable,” it seems useless to note. But not to the collector. Such errors are known as “first edition points.” A first edition point is a property that can be found in the first edition of a book, and in addition to other points (perhaps a misprinted ISBN number, as is the case with Norman MaClean’s A River Runs through It) identify the book as a true first edition. 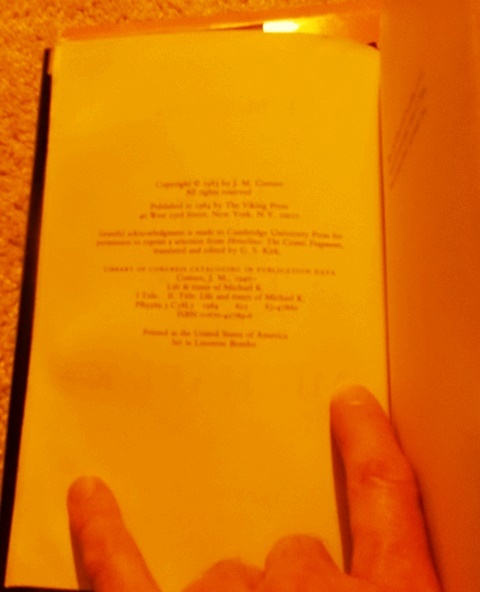 As such, the errors bestow value as secondary attributes confirming an edition’s authenticity. Deformity is not in this sense a singularity, but indication of a type: in capital, even errors are valuable.